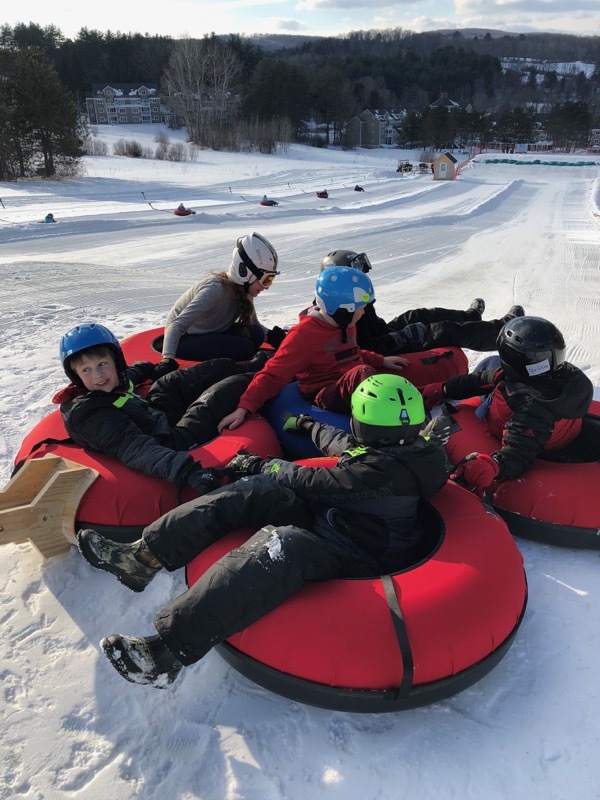 Tubing has arrived at Ascutney Outdoors! Our new dedicated tubing park is located just down slope from the Ascutney Outdoors Center. The new 500-foot tubing lift transports young and young-at-heart uphill to slide down a groomed slope for hours of enjoyment, both day and night. Use of the Tubing Lift and tubing run requires a lift ticket, which includes a tube provided by Ascutney Outdoors. For safety reasons, no other tubes or sliding equipment may be used. Tickets are sold at the AOC; the tubes are provided at the tubing hut adjacent to the parking lot. Our operations are dependent on volunteers, weather, and natural snow conditions and may be subject to change at any time. Please check our website home page for the most up-to-date information on operations. We also post on Facebook. Please see the Alpine Skiing tab for skiing hours of operation. Tickets are available at the Ascutney Outdoors Center. Ticket packets cost $10 and are good for 6 rides up the lift.